The X2 is unequaled in value, versatility and efficient design. Shape your body, get strong, lose weight, even improve your golf swing with the BodyCraft X2 Strength Training System. The two weight stack design allows for multiple users at the same time on The X2. Easy reference exercise charts are permanently mounted to steel plates on all four sides. Pictures and descriptions of 40 different exercises show proper positioning and form and the muscles worked. Ab Crunch / French Curl Station for strengthening and shaping abdominal muscles. Can also be used for Triceps Extension (French Curls). Consumer Guide Best Buy Rating. 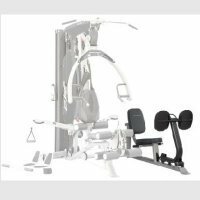 Bodycraft X2 Home Gym is a leading Home Gym in the fitness industry. Shape your body, get strong, lose weight, and even improve your golf swing with the BodyCraft X2 Dual Stack Gym strength training system (formerly the Family XPress). The X2 is distinguished by its dual weight stack design, which lets couples work out simultaneously on different weight stations at the same time. It's ideal for couples who want to make their workouts more efficient, or for folks who want to keep their pulse rate high while circuit training. The X2 includes such features as a bench press station with an adjustable starting point, a cable station with adjustable arms that supports more than 100 different exercises, an ab crunch station for abdominal training, and a leg extension and curl station for performing seated leg extensions and standing leg curls. Add it all together and you have a terrific gym for home workout enthusiasts. Users will also appreciate the X2's series of pulleys, which includes a mid pulley for ab crunches and tricep extensions, a high pulley for lat pulldowns and tricep pushdowns, and a low pulley with a foot plate for low rows, leg and hip exercises, arm curls, upright rows, and more. The X2 uses these pulleys and cables to deliver unrestricted, completely natural, biomechanically correct movements. You define the path, providing for a greater, more natural range of motion that incorporates the use of stabilizer and core muscle groups, an advantage not found on typical home gyms. Finally, the X2 includes a 200-pound weight stack that can be doubled to 400 pounds when combined with the leg press, which is cabled at a 1:2 ratio. Construction features include 12-gauge steel tubing; flexible, nylon-coated aircraft cable rated at more than 2,000-pounds tensile strength; 4.5-inch-diameter, fiberglass-impregnated nylon pulleys with sealed ball bearings; 2-inch-thick high-density foam covered with double-stitched vinyl; an adjustable seat and seat back; chrome-plated 1-inch tubular steel guide rods; noise-dampening, perforated steel weight stack guards; and a silver powder-coated finish. In addition, users can easily add supplementary attachments, including an optional hip station, knee raise/dip station, or leg press station. The X2 measures 84 by 83 by 105 inches (W x H x D) and comes with a lat pull bar, curl bar, ankle strap, and two single pull handles. It's also backed by a lifetime warranty. Since it is built to last a lifetime, every part of the BodyCraft Elite is guaranteed for as long as you own it. We will replace or repair any defect. Warranty applies only to the original owner and for in-home use. Frame: Heavy 11 gauge, 3.25"X1.75" oval steel tubing. Exclusive design of the seat back on the BodyCraft Elite Home Gym provides great lumbar support while reducing stress on the spine. Versatile! Literally hundreds of strength training exercises can be performed on this Elite home gym for your specific activity, sport, general toning, or for pure strength and size. Heavy duty steel construction, orthopaedic seat and backrest and a 200lb weight stack are just some of the excellent features of the Bodycraft Elite Home Gym. 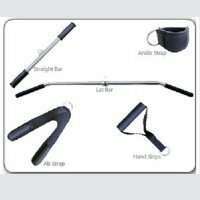 With cable pulleys for functional training, over 100 exercises and attachments including; lat pulldown bar, curl bar, ankle strap and 2 single stirrup handles, this home gym is an exceptional piece of equipment. With the Bodycraft Elite Single Stack Home Gym you have a choice between four different colors that the gym can go in. Choose the color that best suits you and matches your room color scheme. The gym comes in the following colors: Sea Green, Graphite, Satin White, Bronze or Silver. BodyCraft continues to become a dominate brand in the strength category and for good reason. Their Platinum gyms, Jones Smith and F-660 Hip Sled are some of the best products on the market and the Elite home gym exemplifies this high standard. With multi functional arms, adjustable press/row arm, self-aligning leg roller, swiveling low pulley, spring assisted seating and 400lbs press station (though their 2x cable system) that features their amazing Active Balance design, the ELITE is one of the nicest pieces to ever carry the BodyCraft badge.